Participating in culture and sport equivalent to a pay rise? Research funded by the Department for Culture, Media and Sport has suggested that the boost to individuals’ wellbeing achieved through weekly participation in sport is equivalent to £11,000 per year in household income. Cinema (c.£9,000) and concert (c.£9,000) attendance are not far behind in terms of annual ‘value’. The research, Understanding the value of engagement in culture and sport (pdf, 291kb), which is based on a statistical analysis of the British Household Panel Survey, estimates the equivalent boost in household income required to achieve the same boost in wellbeing generated by cultural participation. The work is something of a departure from previous estimates (such as those which calculate the monetary value of sport by referring to the cost of physical inactivity to the NHS) in that it factors in other influences on wellbeing such as socioeconomic status, thereby isolating the effect of culture. As the authors note, the findings have the potential to guide policymakers, indicating the level of investment that may be warranted in interventions aimed at increasing participation in culture and sport. The Observatory has published this year’s review of West Midlands skills performance . 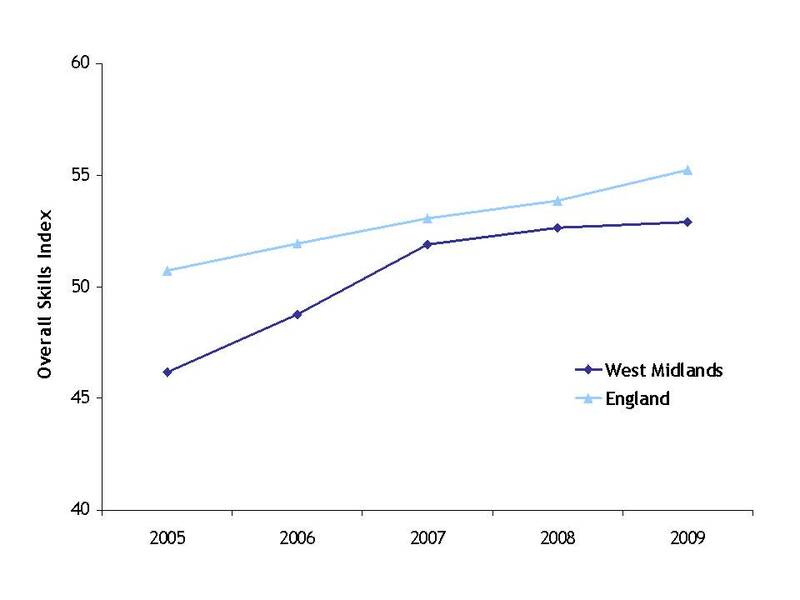 Our summary skills index based on a range of measures (such as GVA per employee, investment in training, and qualification attainment amongst young people and adults) reveals the West Midlands skills performance has begun to widen again, from 1.1 points in 2007 to 2.3 points in 2009. As a result the West Midlands has dropped from 5th to 6th place in the league table of regions.